A Secular Europe assesses the problem of accommodating diverse religious practices across Europe within a secular legal framework. Mick Power finds that although there is some repetition due to many of the chapters being published previously as separate papers, the book offers a valuable contribution to the debate on how European states should approach the issue of religion. 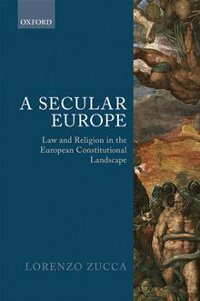 A Secular Europe: Law and Religion in the European Constitutional Landscape. Lorenzo Zucca. Oxford University Press. October 2012. Europe is beset with problems, but these are not just the current financial ones. Let’s start with some of our great historical legacy. In the 4th century the Roman Emperor Constantine decided to convert the Roman Empire to Christianity, as much it would seem for political reasons as religious, in that Christianity helped glue together a disparate and disintegrating empire for longer than it might otherwise have survived. However, by the 15th and 16th centuries, the splintering of European Christianity with the Reformation saw a succession of religious wars that devastated much of Europe. The peace treaties of Westphalia (1648) attempted to cure this continual conflict through the partitioning of Europe into single religion-based nations or regions, which at least for a time significantly reduced the number of religious wars. Roll the clock forward a few more centuries, however, and we can see that what offered a cure in the 17th century has become part of the European problem for the 20th and 21st centuries. One of the great challenges for the European “Union” is how to sit astride national extremes, from the UK’s established Protestant Church and multicultural philosophy, to the other extreme of France with its republican secularism and monocultural assimilation approach. In A Secular Europe, Lorenzo Zucca offers an insightful analysis of the current political and religious problems that divide Europe, in particular, in the light of a series of legal test cases that have reached the European courts. A Secular Europe is at its best when it considers the issue of religious diversity and the problems caused for individual nations. For example, the French assimilation approach seems to have alienated most Muslims because of the banning of the hijab (wearing of a veil) in schools and the more recent banning of the burqa in public places. In contrast, the multicultural perspective espoused in the UK includes state sponsorship of faith-based schools, which superficially might seem a preferable and more tolerant approach to religious diversity within a secular society, but in practice leads to a host of different problems. In the case of Lautsi v Italy, the European Court of Human Rights had to consider a complaint against the presence of crucifixes in all Italian state schools, which the Court perversely resolved by stating that the crucifix was merely a “passive symbol” that was neutral in its religious implications. You see what happens when you leave important decisions to courts of law! Zucca rightly argues that the appropriate approach to religious diversity in modern secular societies is neither to hide religions away in their own ghettos, nor to homogenise all into a single republicanism. Instead, the answer for Italian (and therefore other) state schools should be to endorse the crucifix as a religious symbol, but to include multiple other religious symbols alongside it and to encourage knowledgeable debate about religions throughout European society. However, Zucca needs to go even further with his argument. European classrooms should not only include crucifixes, prayer wheels, elephant gods, pictures of Ron Hubbard, or whatever else is needed to represent the diversity of religious faiths, but should also have pictures of the solar system, Mendeleev’s periodic table, the DNA double helix (and so on) in order to represent the increasing range of scientific and other atheist viewpoints. Zucca appears to believe that religion is becoming significant again in Europe, but that is only because religious ghettos like the Vatican State have started shouting loudly because they are as terrified of the new atheism as they once were terrified of the Protestant Reformers. Religious groups have begun to exploit European national and supranational issues with diversity, but even the established religions are sinking beneath the tide of indifference and disbelief that increases generation-by-generation in Europe. While one can fully agree that openness and debate is the best way forward to understand and integrate diverse views into our pluralistic cultures, all religions represent only minority groups within Europe and regularly need to be reminded of their new position whether or not they can claim to be established. That has certainly been one of the great strengths of French republicanism. A Secular Europe argues the case for tolerance of diversity within secular society effectively, while drawing primarily on recent national and supranational legal cases that have received widespread media coverage. However, the book suffers from some repetition because many of the chapters have been published previously as stand-alone papers. Nevertheless, Zucca’s proposals provide an essential next step and a way forward in the midst of Europe’s current round of religious wars. Mick Power is a Professor of Clinical Psychology at the University of Edinburgh. His most recent book is Adieu to God: Why Psychology Leads to Atheism (Wiley-Blackwell, 2012) which is an account of the psychological reasons why religion survives in the face of scientific evidence to the contrary.